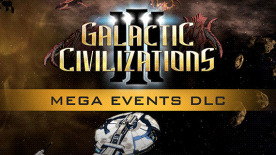 Shake up your gameplay with new galaxy-wide Mega Events! These new events introduce additional complexity requiring your skill and strategy to overcome if you hope to be victorious. Dread Lords Return: A dormant Dread Lord colony awakens. Stop them before they become too powerful and wipe out all life in the galaxy. Peacekeepers: A large force of time-travelling robots appear and declare that they have been sent back to stop the conflicts that endanger the future. Assassination: A beloved leader is assassinated, the new leader vows revenge plunging the galaxy into war. Space Monster: Dangerous space faring creatures, the distant relatives to the Living ships of the Dread Lords, begin to appear in the galaxy again. They will continue to spread until exterminated. The Artifact: A mysterious precursor Artifact appears and starts boosting the power of a previously weak race. Their power begins to grow each turn. The only way to stop them from becoming gods is to kill them first.